English Cream Golden Retriever - What Can Their Color Really Tell You? You are here: Home / Dog Science / English Cream Golden Retriever – What Can Their Color Really Tell You? The English Cream Golden Retriever is just called a Golden Retriever outside the US. The main difference between an English Cream Golden Retriever and the American Golden Retriever is their fur color. English Cream Golden Retrievers have much lighter fur. They are also generally stockier and heavier than their American counterparts. But, English cream goldens are the same dog as any purebred Golden Retriever. This breed is famous for their thick, lustrous fur. It’s often seen in the gold color for which they’ve been named. We’ll see if coat color plays a role in temperament, health, or other physical characteristics. This article gives you all of the English Cream Golden Retriever information you need to know if this is the right dog for you. All Golden Retrievers, regardless of color, originated in Scotland. Lord Tweedmouth set out to develop the ideal gundog. It was to suit the wet climate and rugged terrain of the Scottish highlands. In the late 1800s he crossed a Yellow Retriever with the now extinct Tweed Water Spaniel. Later, the Bloodhound and the Irish Setter were added to the mix. You may have heard that Cream Golden Retrievers are more laid-back than their darker-coated cousins. There is no scientific evidence to back this up. But it has been proven that breeding for desired traits combined with optimal environmental conditions can have a huge effect on temperament. Goldens are prized for their even-tempered, obedient, playful, clever, friendly, and trusting character. They’re known for being good with children, kind to strangers, and happy with other pets. This hardworking breed makes a great family dog. They also excel as therapy, guide, service, and search and rescue dogs. English Cream Golden Retrievers are called Golden Retrievers outside of the U.S. This is to distinguish them from the American standard. Is it an Accepted Breed? The American Kennel Club (AKC) does not accept extremely light colored dogs. But, the British Kennel Club (KC) does. Although they won’t accept the darker mahogany color that the AKC does. This can be confusing. But, if you’re not planning to show your dog, this won’t matter. Color just comes down to personal preference. A lighter coat is the main difference between English Cream Golden Retrievers and American Goldens. But there are others. These are not due to coat color. But, because Americans developed a different standard of breeding. The KC height standard for males is 22 to 24 inches. For females it’s 20 to 22 inches. While the AKC standard height for males is 23 to 24 inches. For females it’s 21.5 to 22.5 inches. The English Cream Golden Retriever is slightly stockier and heavier. It has a broader head, wider muzzle, and eyes that are darker and rounder. Their ears are level with their eyes. But the American’s are set behind and just above the eyes. The top line of the English Cream is level and the tail is level with the back. But the American’s back slopes slightly and the tail may have a moderate upward curve. They’re also less muscular, with a more free-flowing gait. This may be due to their sloping topline and angular hindquarters. Other than color, the coat of English Cream Golden Retriever may also be shorter than the American’s. However, this doesn’t mean they shed less. Golden Retrievers in any color will shed a lot year round. In the spring and fall they’ll shed more when they “blow” their dense undercoat. Their coat lies flat against the body and may be straight or wavy. Feathering, especially on the neck and chest, may be lighter than rest of the coat. Shedding can be tough to control. But check out our product guides to help groom these hairy dogs and control their fur. The Morris Animal Foundation, Golden Retriever Lifetime Study is one of the largest canine health studies in the U.S.
Its job is to find the nutritional, environmental, lifestyle, and genetic risk factors for cancer and other diseases in dogs. Unfortunately, Golden Retrievers are at an increased risk for cancer compared to other breeds. This survey by the Golden Retriever Club of America found that 61.8% of American Golden Retriever’s died from cancers. While this survey found that 38.8% of English Golden Retrievers were affected. Is the English Golden Retriever Healthier? These figures have led many to think the English Cream Golden Retriever is healthier than his American cousin. But, be aware the response rate was only 16.4%. Whether a Golden Retriever is English or American, their health and cancer risk will have a lot to do with good breeding and optimal care. It should also be noted that neutering can increase the risk of certain cancers in the breed. Some reports state the average lifespan is 12 years and 3 months for an English Cream Golden Retriever. It’s 10 years and 8 months for the American. But, the UK Kennel Club lists lifespan simply as over 10 years for the cream golden. The AKC estimates a lifespan of 10 to 12 years for the American. Progress has been made in identifying genes causing pigmentation in dogs. But, there’s still much to learn. The e/e genotype gives a Golden Retriever a cream color instead of the normal yellow to golden hue. There’s no indication that this gene has any bearing on their health. You may find advertisements trying to convince you that these dogs are really rare. They may be sold as “Exquisite Platinum Imported Golden Retrievers” or “Irish Cream Golden Retrievers”. This is an effort to make them seem more unique and valuable. Some claim that English Cream Golden Retrievers are healthier or have a better temperament than American Golden Retrievers. Claims like these allow less reputable breeders to charge more for their dogs. Despite the slight physical differences, these dogs are still purebred Golden Retrievers. So, they’re just like their darker relatives. The cream color has always been part of the full spectrum of breed colors. In fact, it’s possible for both light and dark coated puppies to be part of the same litter. When looking for a good breeder, it’s best to avoid those who focus just on one color. A breeder who cares about their dogs will always put their health and wellbeing above anything else. Seeing any specific coat color take precedence should be a red flag. Steer clear of these breeders. Aiming for one color would needlessly narrow the gene pool. Plus, it may increase the risk of genetic predispositions towards hereditary conditions. As well as cancer, Golden Retrievers are also prone to other health problems. A good breeder will also allow you to see where the puppies live and introduce you to the parents and siblings. 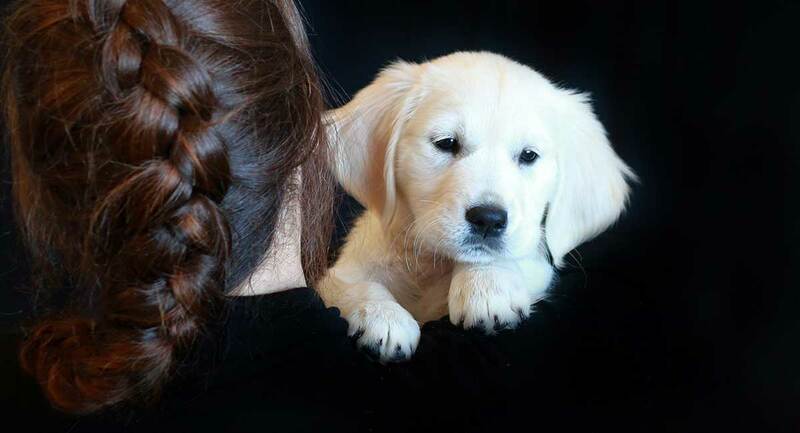 There are many factors that can affect the price of a purebred puppy. “Show” or “working” quality will set you back more than a “pet” quality dog. If the puppy’s parents were champions, then price can rocket. Gender, size, and birth order, among other factors, can also affect cost. You can expect to pay between $1,500 and $2,500 from a reputable breeder. Avoid buying from a pet store. These dogs may be cheaper. But, there’s a good chance they came from a puppy mill. These breeding facilities are known for churning out poorly bred dogs. Saving a few hundred dollars up front will seem like chicken feed in the long run. As you may end up spending thousands of dollars on visits to the vet. Plus, the dog has a compromised quality of life. This article will give you more information about the cost of buying and caring for a Golden Retriever. If you’re not sure whether the English Cream Golden Retriever is the best pup for you, there are lots of other breeds you can choose. There are plenty of similar purebred pups. But also mixed breeds that feature the great qualities of the Golden Retriever with another dog! Instead you could adopt a dog. This is a less expensive option than buying from a breeder. Since the Golden Retriever is such a popular breed you may find just the dog you’re looking for. Best of all, you’ll be saving a dog who needs a new home. Do you have an English Cream Golden Retriever? Tell us about your dog in the comments below.